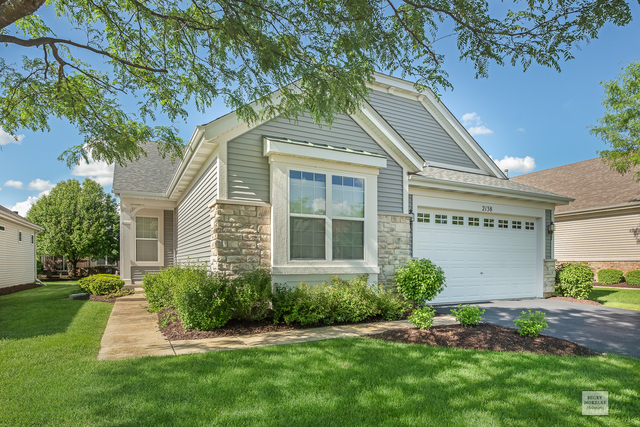 Enjoy the good life in desirable Carillon at Stonegate, a beautiful 55+ community with swimming pool, clubhouse with exercise room, tennis courts and more. Professional lawn care and snow removal are also included! This perfectly sized Ranch home is just shy of 2,000 sq.ft. and features great curb appeal with a partial stone front and cute front porch, plus 9 ft ceilings, 6 panel doors and white trim thru out. There&apos;s plenty of living space here, thanks to a dining room, living room, family room, den, and a big eat-in kitchen with a breakfast bar! The master bedroom has great natural light, a transom window, both a reach-in and a walk-in closet, and a private bathroom with tile surround in the shower. New roof and siding in 2014. Newer hot water heater. New sump pump with battery backup in 2018. There&apos;s a ramp in the attached 2 car garage, along with a workbench. Wide doorways, grab bars in showers, and no interior stairs lends disability access. Low maintenance living at it&apos;s best!